Guest Artist Kristen of Morbidly Cute wrote this tutorial and very kindly let me post it here for all of cyber space to see. What a sweetie! There's a link at the bottom of the project instructions for the Morbidly Cute Etsy Shop. Check out her store and buy yourself a little something! Polymer clay bead making isn't really my forte. I've played around with polymer clay in the past (and have some really ugly fridge magnets and a necklace for my cat to show for it! ), but I couldn't really get the hang of sculpting. My husband still mocks my polymer clay bead cat necklace from time to time. I think it's pretty funny too, but not that funny. 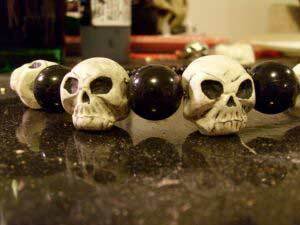 Making beads with polymer clay has been a bit of a sore point with me ever since. I really like this mold making idea because it looks like something anyone can do well without much practice. It looks like I'll be trying my hand at polymer clay bead making again real soon!